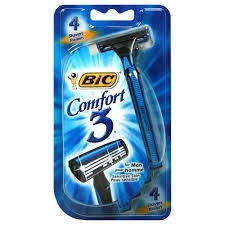 BIC Comfort 3 features 3 blades that provide a close, comfortable shave. Textured handle and pivoting head offer better control. The lubricating strip with Aloe provides better comfort and sensitive skin. Each package contains four razors.